The Brooklyn Heights Association was founded in 1910 to promote the neighborhood’s welfare and interests, including the preservation of its unique architectural character. The Brooklyn Heights Association (BHA) was founded to promote the welfare and interests of the residential neighborhood of Brooklyn Heights. Today, it works to protect the architectural fabric and visual landscape of the neighborhood through a Design Advisory Council to advise residents on conservation of historic buildings, a plaque program, and conducting historic house tours. The Brooklyn Heights Association (BHA) was founded in 1910, making it the oldest ongoing neighborhood association in the five boroughs.1 Throughout its history BHA has focused on maintaining quality of life and neighborhood character and the organization built its constituency by opposing projects that threatened the residential character of the neighborhood and housing issues raised by urban renewal projects and highway construction. In the mid-1950s, the BHA was in a precarious position financially and institutionally. Brooklyn Heights had begun to change, as well. New residents, mainly young professionals and their families, moved to the Heights and took an interest in revitalizing the neighborhood. These new residents recognized that the special character of Brooklyn Heights had much to do with the historic, human-scale architecture and infused the neighborhood with enthusiasm, energy, and the idea of maintaining the residential character by preserving its architecture. These new residents started the Community Conservation & Improvement Council, known as CCIC (“kick”).6 CCIC recruited BHA's William Fisher to its early leadership. 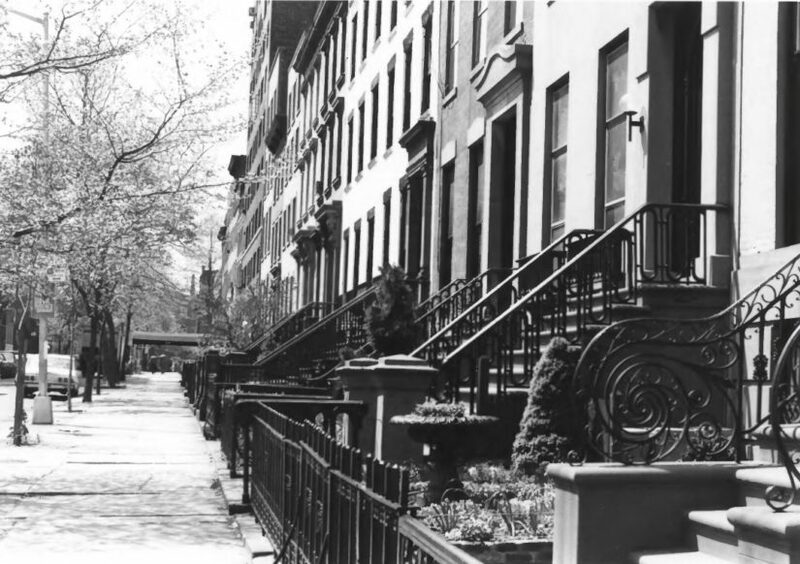 CCIC introduced the Bard Act to Brooklyn Heights and with it, the idea of special zoning to protect the architecture of the neighborhood.7 CCIC’s declaration in 1959 that it would introduce a resolution for such an ordinance and the popular support for the idea forced the BHA to recognize this new approach to improving its neighborhood. BHA formed a committee to address the ideas of CCIC and selected Fisher to head the committee. CCIC’s energy and ideas soon began to transform the more established, complacent BHA. Though they remained two groups with different approaches to the same set of issues, the leadership of the two organizations overlapped considerably. William Fisher, Otis Pratt Pearsall, and Arden Rathkopf were extremely active and shaped policy in both organizations. CCIC and BHA began to work in tandem to determine new ways to preserve Brooklyn Heights. Aided by a growing constituency in Brooklyn Heights and citywide for preservation, BHA stocked its arsenal with the Bard Act and the list of “Buildings on Brooklyn Heights” included within the Municipal Art Society and Society of Architectural Historians’ Index of Architecturally Notable Structures.8 CCIC and BHA were enmeshed by the time they jointly introduced a "Historic Zoning" resolution for the city, drafted by Arden Rathkopf, at the April 13, 1959 City Planning Commission public hearing.9 BHA would follow Rathkopf’s advice and support the ordinance for the entire City as opposed to CCIC’s preference to push application of the "historic zoning" only to Brooklyn Heights. Zoning would remain at the forefront of BHA’s agenda. At the group's May 1959 annual meeting, Planning Commissioner James Felt spoke on zoning and the use of the Bard Act to bring about protection for historic and architectural resources.10 Though, Felt encouraged Brooklyn Heights to join city-wide efforts for legislation to protect historic resources rather than the singular district sought by one group of Brooklyn Heights residents. Though BHA and CCIC’s resolution was not adopted by the City Planning Commission as part of the 1961 zoning resolution, the terms brought forth by BHA and CCIC connected the dots between the raw materials: the Bard Act and the desire to preserve architectural character of an entire neighborhood. Rathkopf's zoning resolution bore strong resemblance to the Landmarks Law that would eventually be adopted in 1965 to make Brooklyn Heights New York City's first historic district. "Otis Pratt Pearsall's Reminiscences of the Nine Year Effort to Designate Brooklyn Heights as New York City's First Historic District and Its First Limited Heights District," Village Views Vol. 7, No. 2 (1995): pages 29-48. Anthony C. Wood, Preserving New York: Winning the Right to Protect A City’s Landmarks (New York: Routledge, 2008), page 200. Meredith B. Langstaff, Brooklyn Heights Yesterday Today Tomorrow (New York: Brooklyn Heights Association, 1937). Anthony C. Wood, Preserving New York: Winning the Right to Protect A City’s Landmarks (New York: Routledge, 2008), pages 201-202. ”Cadman Plaza Sponsor Chosen For Family Co-op Apartments,” The New York Times, 10 February 1961. ”Zoning Code Lauded Here,” Brooklyn Heights Press, 22 December 1960. ”New Group Charts Plan For Housing,” Brooklyn Heights Press, 24 December 1958. Gregory F. Gilmartin, Shaping the City: New York and the Municipal Art Society (Clarkson Potter/Publishers: New York, 1995), page 365. Anthony C. Wood, Preserving New York: Winning the Right to Protect A City’s Landmarks (New York: Routledge, 2008), page 214. “BHA Pleads for ‘Historic Zoning,'” Brooklyn Heights Press, 16 April 1959. James Felt, “Zoning for a Better City,” The Brooklyn Heights Association 50th Annual Meeting Minutes, 11 May 1959.